On Sunday I went to the christening of my boyfriend's cousin's baby (1st cousin once removed?) and it was the first christening I've ever been to. I didn't even have one myself and my boyfriend had a naming ceremony instead because his parents are hippies. It was the first time I'd met this branch of the family and I can now proudly say I've met every single one of them. Boyfriend family challenge = complete! Big eyes and a smile = instant cuteness! I regret not taking more pictures in better lighting but there wasn't much time between finishing and giving him away (woops!) 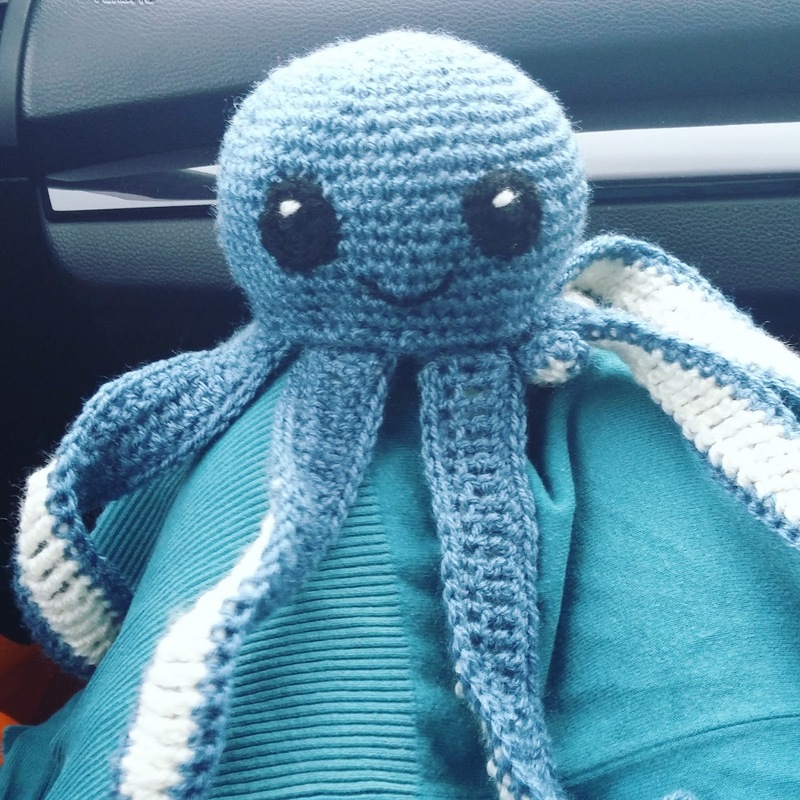 He was so well received though, they all kept mentioning it and saying I should sell them and demanding more crochet toys. I ended up really embarrassed because of how impressed they were. The baby herself seemed to think it was a type of throwing star, she was also pretty cute. You can find the pattern here: it's free and very easy to follow. If I were to do it again I'd make the tentacles as part of the body and crochet them in the rounds, instead of making them separately and sewing them on afterwards. 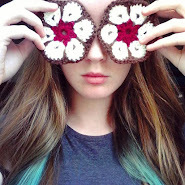 I also crocheted an octagon, sewed the tentacles to that, then sewed that on the body, just so they were evenly spaced. For the eyes I did 6sc in a magic ring and then 2sc in each stitch (12sc) with a little bit of white wool as a highlight. The mouth is back stitched wool. I've been hiding of your blog for a while now. I hope you don't mind! I just love reading about other people's lives. Do you think this would be good for a second project? All I made before is a lumpy scarf but I know all the stitches except a magic ring, what is that? Hi Corina, thank you for your comment! Blogs are here to be read and I really appreciate you taking the time to say hello. I think as long as you have patience you can do any project you set your mind to, but this one is especially good. I’d recommend using a stitch marker (I just use a paper clip) so that you don’t lose where the end of your row is; it can get confusing going round in a spiral all the time. Here is a very good tutorial for the magic ring (http://www.planetjune.com/blog/tutorials/magic-ring-right-handed/) You can use it for anything you don’t want a hole in the top of, like hats and amigurumi. Good luck with your little octopus friend and let me know how it goes, if you can!